Leigh Bardugo did it again. I absolutely loved the Grisha trilogy and I adored this one just as much! The world of the Grisha is just so beautiful and well written and I didn’t know how much I had missed it until I started reading this and was sucked right back in. This time we’re not in Russia-inspired Ravka anymore, but the world is expanding even more than before. We get to learn about Kerch and it’s Amsterdam-inspired Ketterdam. And not just that, but we also learn more about the other nationalities, like the Fjerdans and the Shu-Hans and it is glorious. The plot is awesome in all it’s Ocean’s 11 like epicness. I read the last half in one sitting because I just COULD NOT STOP READING. It felt like I was right there with the crew pulling of the heist and it was one crazy, adrenaline-filled ride until the ending. But what really surprised me were the characters. There are six characters and the book is told from different point of views. I’m a fan of multiple POV’s in a book, but usually there is always one or two I prefer over the others. And while reading the book I tend to get annoyed when I have to leave my favourite POV for a less exciting one. But that was so not the case in this book! Each character was equally well fleshed out, equally sympathetic and equally fun to read from their POV. I loved them all. I loved Kaz with his criminal mastermind and his demons. I loved Inej and her never-ending strength and faith. I loved Nina and her devotion to do the right thing for her friends and her love for food. I loved Matthias and his struggle with his faith and his feelings. I loved Jesper and his witty comebacks. I loved Wylan and his intelligence and his cute bantering. The development of the relationships between the characters was just perfect! 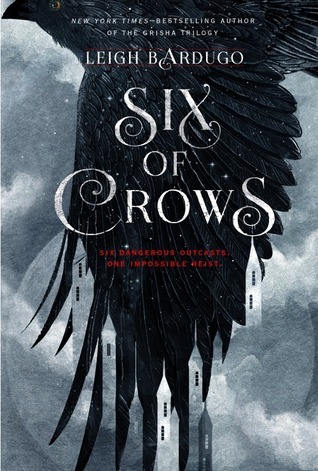 Leigh Bardugo really knows how to write an ecclectic group of characters and make them all seem so real. As a reader you really believe and feel it when this group of outcasts goes from being a crew to being a family. And while the romance is more on the background, it is there and it is perfect. I think this book alone just gave me 3 new OTP’s. I honestly can’t find a single flaw in this book. It is definitely a new addition to my all-time favourites and I can’t wait to start Crooked Kingdom!